Baby girl has crossed the first birthday line into toddlerhood. So, to celebrate, we had the family over for some tea and treats. 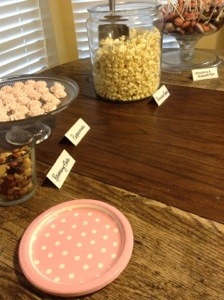 This was not your English tea party though…kid friendly confections and sweet tea on ice. Steep tea in boiling water for 5 minutes, then add orange juice, honey and cold water. Tinted them baby pink and froze them until the day of the party. These beauties have the same crunch and chew that a french meringue does. They were cheap, easy, and great for prep ahead. I used an extra large tip to pipe them, and this recipe made at least three dozen. Preheat oven to 200 degrees. Make mints, pipe onto waxed paper lined sheet trays. Place trays in oven. Turn off oven and leave mints for the rest of the night. The next morning, put in freezer proof container, dividing layers with parchment paper and freeze until you need them. They come to room temperature rather quickly. In a pitcher, add simple syrup, thyme sprigs, and water. In a separate pitcher, juice lemons and strain juice through fine mesh. Add juice to mixture in serving pitcher. You may have to add more simple syrup depending on your taste for sweetness. Allow to chill for several hours before serving so thyme flavor can infuse in lemonade. This party was pretty budget friendly. 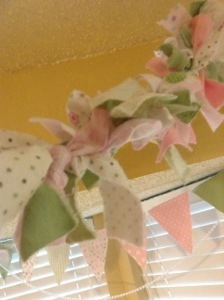 A shabby chic theme fit easily with a first birthday and repurposing things we had on hand. We made the decorations out of Baby Girl’s baby blankets, I took her one year portraits, and we always have homemade cakes. Popcorn and tea are cheap. The older kids loved popping popcorn in the air popper. To add a little flair to the popcorn, we tossed in some grated parmesan and minced rosemary from our garden. 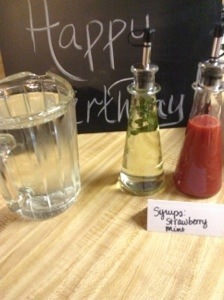 I also made some regular tea and had strawberry and mint syrups for guests to add as they pleased. I served all decaf tea, so everyone could enjoy. I have said many times, and I will say it again, my family and friends are AMAZING, so I borrowed clear glass serving pieces from everyone. I have a friend that is a talented photographer, so he took pictures the day of the party. I must say some of the candids from people’s phones have been my favorites. The cakes are the only thing that got a little out of hand. I had to have strawberry, chocolate, and vanilla. I wanted them to be tiered, and if you look at my Pinterest board, I wanted quite intricate decorations. 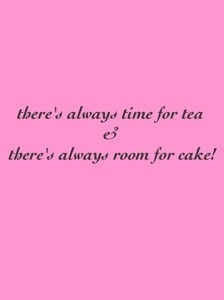 In my head there is nothing Man cannot do, so if I made a giant mess of the cakes, naturally he could fix it. In the end, we ended up not stacking them. Baby girl had her own smash cake and everyone else ate the other. This strawberry cake recipe is amazing and has not failed me yet, although I would love to find one that doesn’t require strawberry Jell-O. So, if you are holding out, please send me one! 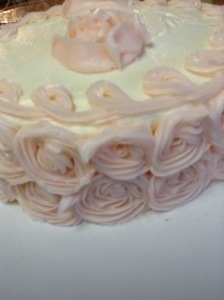 I relied on Smitten Kitchen to provide the vanilla cake recipe (LOVE her blog). I don’t think I will use that recipe again, but I will say…it was super moist (to the point it was a pain to do the crumb coat) until it dried out and then it was just too crumbly. If you use it, put a filling between the layers, to me it needs it to balance the cake. 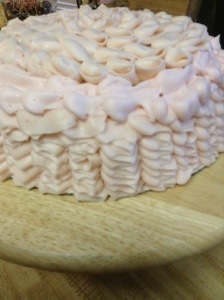 I used a buttercream that was VERY temperamental so I am not including that recipe. The weather was very rainy the day of her party or I would have tried Smitten Kitchen’s swiss buttercream which sounded amazing (yeah, I chickened out). 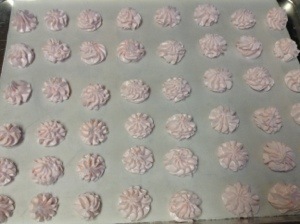 The later it got that night, I tried to find really cute, really simple piping, so I found these tutorials (rosettes & ruffles) on YouTube and the final result is what you see in the pictures. Beware, these two techniques take an insane amount of frosting. We burned through a triple batch of frosting for 8 inch based three layer cake. It was a pretty cute little party for a pretty cute little girl! I cannot thank all my friends that helped with my crafts, cakes, and other obsessions that week enough. And, of course, Man had some macgyvering to do.